We are pleased to offer our students a variety of choices in activities to round out their education. We believe that participation in sports strengthens the mind as well as the body, develops leadership skills, and teaches critical social skills. We recognize that the imperishable crown offered by Jesus Christ far exceeds any of the perishable crowns or trophies offered by this world. As a Catholic school, SJPII upholds Christian values and principles. Though our athletic teams strive to win in the sense of having the best score, we recognize the real value of Catholic school athletics is realized only if it fosters the development of the human person, both in spirit and in body, by cultivating Christian character, strengthening personal integrity and responsibility, and promoting the pursuit of excellence in all endeavors. Participation on a team is a privilege. With this privilege come responsibilities in the areas of preparation, attitude, sportsmanship, and academics. These responsibilities exist both in and out of school, and both in athletic and non-athletic settings. We recognize the need for God’s support and guidance in meeting these responsibilities. The St. John Paul II (SJPII) Athletic Program dedicates itself to the pursuit of excellence in athletics within the framework of a Catholic community and in accordance with its primary role as an educator and spiritual guide. The athletics program is committed to providing opportunities for the individual student-athlete to reach his/her highest potential while developing the qualities and spirit of a Catholic Christian. 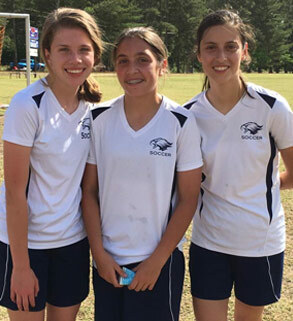 SJPII is a member of in the South Eastern Middle School Athletic Conference (SEMSAC), a conference comprised of area private schools throughout the Sandhills area. SJPII plays under the North Carolina High School Athletic Association rules as amended by the bylaws of the SEMSAC. In addition to playing conference games, SJPII teams may on occasion play other schools in the area. Thus, SJPII athletes play students from diverse backgrounds and skill levels. Our Eagles athletics program offers several sports programs for students to participate in. We have plans to expand our program based upon family interest and student participation. The Eagles Cross Country team trains together starting in August each year. We run four days a week, alternating practices on campus and at Reservoir Park in Southern Pines. 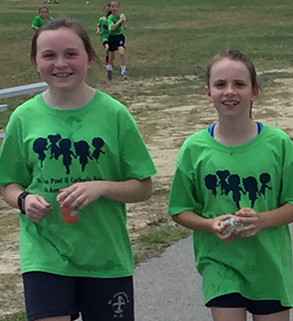 Staff and volunteer coaches work with the teams to develop talent and build strategy so that runners understand and improve their own abilities but also come to see how their skills affect team capabilities. Want to know if our teams are playing tonight? Just check our Calendar, and download our schedules below. We’re proud of our student athletes. Go Eagles! "The will to win means nothing if you haven't the will to prepare."